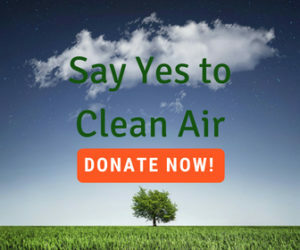 Air pollution in the Grand Valley comes from many sources, including automobile and truck exhaust emissions, gas and oil development, forest fires, wood smoke, methane releases, ozone, dust from roads, agricultural and construction operations, and outdoor burning (yard waste, tree clippings, agricultural burning, etc.). There are even reports of people still burning garbage at night when it is harder to detect. There are currently 880 active oil and and gas wells in Mesa County, according to the Colorado Oil and Gas Conservation Commission, with many more being proposed, including 110 new wells near Whitewater on the southeast side of the Grand Mesa. Even with Colorado’s stringent rules on methane leaks, these wells can have an impact on our air quality, especially with dust from truck traffic on unpaved roads, along with diesel engine fuel exhaust. While we know these sources are all contributing to our air pollution, we have not been able to measure them accurately. Citizens for Clean Air has purchased and mounted 30 Purple Air monitors throughout the valley to measure particulate matter, which accounts for dust, wood smoke, and open burning. The State of Colorado has one ozone monitor for the valley. We are hoping that technology will eventually make it more cost effective to purchase additional ozone monitors so that we can measure our air quality in more locations.